A Brand New Boat! - Rocketship!!! Fiberglass stern bench seat, Digi Trim tabs, Imeron Paint custom SilverBlue, Fold under swim ladder and beach door, Pull up cleats stainless, Walk in console with vanity and sink, Electric sliding doors, Freshwater Head, Fiberglass TTOP with powder coated aluminum, in deck baitwell, electric head rests forward. Pop up storage lockers, electric door forward helm. 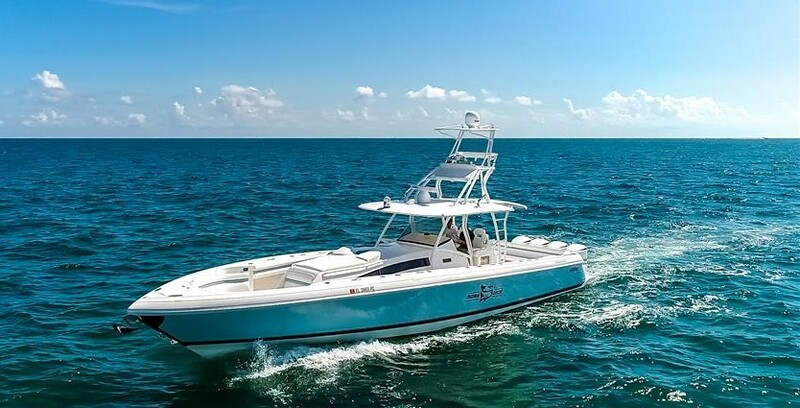 standard features include a transom door, dive platforms, lockable dry storage, pop-up cleats, cockpit bolsters, insulated fish boxes, rod storage, trim tabs, and leaning post with rod holders. Note the 327’s through-stem anchor system. A lengthy option list includes several live wells, windlass, bow thruster, electric helm seat, removable rear seat, underwater lights, etc. A fast ride, twin Mercury 350 Verados reach a top speed of well over 55 knots. SYS Yacht Sales is pleased to assist you in the purchase of this vessel. This boat is centrally listed by #Palm Beach Yacht Sales.